A sincere welcome to our 2017 incoming class – a highly talented and diverse group of 284 students who are pursuing professional or graduate degrees within the College of Pharmacy (COP). They enter a culture at our college that encourages engagement and rewards excellence. Nova Southeastern University (NSU) is in the midst of its “Realizing Potential” campaign. What we do best at the College of Pharmacy is provide students with the opportunities needed to realize their potential. As you will read in this newsletter, our students are encouraged to be involved in the profession and, as a result, are being recognized at local, state, and national levels. Accomplished faculty, a wide range of student organizations and activities, leadership development and personal mentoring at both the college and university levels, give students ongoing support for their professional goals, resulting in an engaged student body who become successful alumni! Our students and faculty in Fort Lauderdale/Davie, Puerto Rico, and Palm Beach are passionately participating in professional activities and creating vital international connections. Don’t miss our Global Pride section for more information on our summer travels around the world. Learning from our international colleagues and helping to transform pharmacy education around the world are part of our strategic plan. NSU COP is proud of our amazing students, alumni, faculty and staff featured in this edition of our newsletter. NSU COP welcomes 284 students into its professional and graduate programs this fall. This year’s orientation activities included informational sessions and meet the faculty opportunities, as well as the annual White Coat Ceremony for the Pharm.D. students. The White Coat Ceremony was once again sponsored by our partner APOTEX, Corp., and marks the professional students’ entry into the profession of pharmacy and a milestone in their journey of pharmacy education. For the past 22 years the College of Pharmacy Continuing Pharmacy Education department has been offering continuing professional development courses for pharmacists and pharmacy technicians from across Florida and the United States. Under the continued leadership of Carsten Evans, Ph.D., executive director, Continuing Education and Professional Affairs, this year the program achieved a full 6-year extension of accreditation from the Accreditation Council for Pharmacy Education (ACPE). Read more. This year, the College of Pharmacy had 60% department participation in the annual giving campaign, ranking as the second highest academic unit university wide. The Office of Annual Fund Department of NSU hosted a "Thanks-A-Latte" breakfast for the College as a token of appreciation for participating in the annual fundraising event. 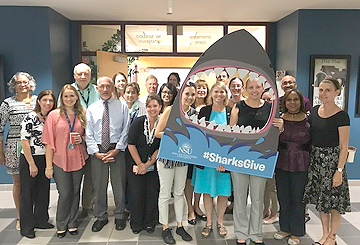 Thanks-A-Latte celebrates those departments within NSU that meet or surpass their department’s annual goal for faculty and staff giving, which is 50%. Thank you to all who support the fund as we continue Realizing Potential. Pharm.D. students from the Class of 2018 Laura Amadeo, Carlos Martínez and Yeiry Pérez presented their first place winning poster from the 2017 Pharmacy Seminar Course entitled Healthware: A New Tool for Pharmacists to Improve Adherence; and faculty member Kalumi Ayala, Pharm.D., (‘05) presented her poster entitled Patient-Centered Clinical Pharmacy Services: Promoting Appropriate Utilization of Natural Supplements in Patients Living with HIV. On the final day of the convention students and faculty participated in the PR Pharmacist Association 5K race. Melissa Jimenez, Pharm.D. (’10) began her PGY-1 Community Pharmacy Residency at the NSU Clinic Pharmacy at the Fort Lauderdale/Davie campus. Prior to coming to NSU COP, Dr. Jimenez worked in independent and community pharmacies and, recognizing the importance of additional training, sought a residency program which would provide the advanced training she desired. Stephanie Kourtakis, Pharm.D., graduated from the University of Michigan in Ann Arbor, Michigan in 2016. She completed her PGY-1 Community Pharmacy Residency at Mercer University College of Pharmacy and Kroger Pharmacy in Atlanta, Georgia. Dr. Kourtakis is passionate about chronic disease management and patient and student education and is serving as a PGY-2 resident in Ambulatory Care at NSU. Alicia Lopez, Pharm.D., graduated from Shenandoah University in Northern Virginia in 2016. Dr. Lopez is completing her PGY-2 Psychiatric Pharmacy Residency at NSU. Lopez is an alumna of NSU having completed her undergraduate degree at NSU. Zachary Pape, Pharm.D., earned his Pharm.D. in 2016 from Drake University in Des Moines, IA. Dr. Pape completed his PGY-1 training at Community-Based Pharmacy Residency at West Virginia University in Morgantown, WV. He will be completing the PGY-2 Ambulatory Care Residency at NSU. Pape is new to South Florida and is excited to advance the role of pharmacists in the ambulatory care setting. Chloe Tamargo, Pharm.D. (’17) is a PGY-1 Managed Care/ACO Resident. Dr. Tamargo is excited to continue her educational journey with NSU COP. For more information on residencies visit NSU COP Residencies. Samuel Lesane, III, joined the student affairs staff at the Fort Lauderdale/Davie campus in July. Prior to coming to NSU Mr. LeSane was at John Jay College in New York, NY. Mr. LeSane will be working to promote the initiatives of the student affairs office and the college. Jose Pomales Lopez, MBA, joins the staff in San Juan, PR as the coordinator of student services and recruitment. He received his M.B.A. from Pontificia Universidad Católica de Puerto Rico and prior to coming to NSU created and served aa author of several workshops on technology in academia. Brian Stonebraker, M.S. is the International Program Coordinator responsible for global initiatives and the advanced standing students. Mr. Stonebraker received his masters in organizational learning and leadership from Barry University and taught K-12 in the School District of St. Lucie County. Marc Sylvestre, B.A., started as Academic Coordinator I in the academic support services department. He received his B.A. from Broward College (BC) and was part of the academic support center at BC for 2 years prior to joining NSU COP. Students at the Puerto Rico Campus participated in an interprofessional health fair in Ponce, Puerto Rico. In addition to the NSU student pharmacists, the collaborative effort included students from the Notre Dame School of Pharmacy (NDMU SOP), Colegio de Farmacéuticos de Puerto Rico (CFPR), University of Puerto Rico School of Pharmacy (UPR), Future Pharmacist Association (FPA) from the Catholic University, and Farmacia el Tuque. Alumnus Juan Santos, Pharm.D. (’05), a NSU Preceptor was proud to be a part of the fair noting that health fairs provide opportunities to share expertise and develop patient counseling skills, while providing valuable health information to patients. Maia Goldberg (’19) attended the Adherence 2017 International Conference on HIV Treatment and Prevention (IPAC) in June in Miami. The conference is dedicated to the presentation and discussion of HIV treatment and biomedical prevention adherence research, as well as current behavioral and clinical perspectives in practicum, within the context of achieving an optimized continuum of HIV care and prevention. Goldberg and faculty mentor Elizabeth Sherman, Pharm.D, AAHIVP (’07) presented their poster entitled “Addressing a critical shortage in the HIV workforce: design and evaluation of an interdisciplinary HIV student symposium”. Co-authors of the poster included Marylee Worley, Pharm.D., BCPS, Mark Schweizer, DDS, Jose Castro, MD, Ana Garcia Ph.D., and Silvia Rabionet, Ed.D. Jessica Greenwood (’18), was awarded the 2017 Norman Tomaka & Family Community Service Award from the Florida Pharmacy Foundation. The award recognizes dedication to community leadership through service, involvement in Florida Pharmacy Association activities, and leadership. Greenwood has served as the American Pharmacists Association Academy of Student Pharmacists (APhA-ASP) Chapter President where she planned, organized, and participated in over 150 community events impacting thousands of persons in the South Florida area. She is currently serving on the FPA Public Affairs Council, is a Student Trustee for the Florida Pharmacy Foundation and previously served on the FPA Student Affairs Council. 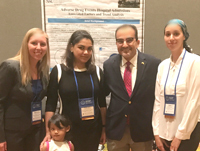 Fatimah Sherbeny, Pharm.D., M.S., Ph.D. candidate (2nd left) in sociobehavioral and administrative pharmacy, presented at the National Association of Boards of Pharmacy (NABP) annual meeting in Orlando. Her poster entitled “Adverse Drug Events Hospital Admission: Trend Analysis and Associated Factors”. The poster was one 15 distinguished posters selected to be presented as part of the Educational Poster Session: Imagineering for the Protection of Public Health at the meeting. Pictured also: Genevieve M. Hale, Pharm.D., Nile M. Khanfar, MBA, Ph.D., and Sarah Alameddine, Pharm.D. Annette Vidal, (’19), was selected as a PQA-CVS Scholar for 2017-18. Vidal will work with David Nau, Ph.D., on a research project related to the quality of medication use. The scholarship will help to pay for travel to the PQA annual meeting in May 2018 to present the research. Vidal is also invited to attend the PQA leadership summit on Nov 1-3, 2017. For more information on this program visit the PQA website. Richard Finkel, Pharm.D. (’92) has served the college for the past 28 years. After graduating in 1992 from the Post Baccalaureate Pharm.D. program at what was then Southeastern University of the Health Sciences, Finkel was hired as one of the early faculty members of the college. He has contributed immensely to the success of the Pharm.D. program, teaching in both core and elective courses. Always helpful and willing to go the extra mile to help his students, Dr. Finkel created online snippets to help his students study drugs and side effects, and has always had an open door and an listening ear to assist students. Dr. Finkel will return in the fall as an adjunct faculty member teaching the Geriatric Pharmacotherapy elective and Non-Prescription Therapies so, while not present on a full-time basis, will still play an integral role in preparing student pharmacists and continuing to contribute to the success of NSU COP. We will certainly miss seeing him on a daily basis but he is looking forward to travelling and spending more time with his wife Mary and their family. Kevin Cowart, Pharm.D., M.P.H., assistant professor, pharmacy practice earned his Pharm.D. degree at the University of South Florida College of Pharmacy, Tampa, FL. Dr. Cowart completed his PGY-1 Pharmacy Residency at Duke University Health System, Duke Regional Hospital, Durham, NC and his PGY-2 Ambulatory Care Pharmacy Residency at the University of Florida, College of Pharmacy in Gainesville, FL. 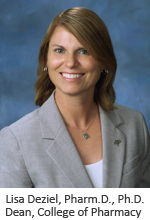 Barbara Hammer, Pharm.D., BCPS, clinical assistant professor, pharmacy practice. Dr. Hammer earned her Pharm.D. at the University of Houston, College of Pharmacy and, prior to joining the faculty at NSU COP, was a Clinical Pharmacist at Boca Raton Regional Hospital, Boca Raton, FL. Karen Sando, Pharm.D., BCACP, BC-ADM, associate professor, pharmacy practice. Dr. Sando is a 2004 graduate of the University of Florida (UF) and served as clinical assistant professor for the past seven years at UF. Sando received her Pharm.D. degree from the University of Florida, College of Pharmacy, Gainesville, FL. Kimmi Stultz, Pharm.D. (’07), CPh, was named Director of Preceptor Development. Dr. Stultz will be working closely with the college IPPE and APPE preceptors to develop a comprehensive preceptor development program to enhance preceptors’ knowledge, skills, professional attitudes and behaviors, and values, and to maintain high quality preceptors and clinical sites which will provide superior training for COP students. Goar Alvarez, Pharm.D. ('92), was a guest on Spanish language television Contigo En La Communicad on Univision Channel 23. The topic was on the newly adopted medical marijuana law in Florida and its impact. To see the interview click here. Barry Bleidt, Pharm.D., Ph.D., was named Honorary Chair for the Social and Administrative Sciences Section 2017-2018 of the American Association of Colleges of Pharmacy (AACP). The award honored his long time services to the Section. Cynthia Moreau, Pharm.D., BCACP, became a Board Certified Ambulatory Pharmacist in July 2017. Appu Rathinavelu, Ph.D., was featured on Translational Research and Economic Development (TRED) Talks, an online video newsletter with provides information on what’s happening in research around NSU. In this TREDTalks video Dr. Rathinavelu discusses how NSU researchers are developing new and safer cancer treatments. To view the video click here. Malav Trivedi, Ph.D., presented on the blog Different Brains® From Autism to Alzheimer’s and all Brains In Between. If you’d like to know more about what epigenetics is and what research on brains is happening here in the Center for Collaborative Research (CCR) by our own Dr. Trivedi, visit the site to learn more about what separates one brain from the other: the Neurometabolism and Epigenetic status of the neurons. Albert I. Wertheimer, Ph.D., was the keynote speaker at the 2017 International Pharmaceutical Student’s Federation (IPSF) World Congress Opening Ceremony in Taipei, Taiwan. Sylvia Torres, Pharm.D. ('95), was promoted to Senior Medical Scientific Liaison, Infectious Diseases at Allergan. Dr. Torres completed residency training at Jackson Memorial Hospital in 2007. Thomas Karadosta, Pharm.D. ('04), is the Vice President Strategic Marketing at ConsortiEX in Milwaukee, WI. ConsortiEX™ is a health care pharmacy IT company. Angela S. Garcia, Pharm.D., M.P.H. ('05) was installed as FPA President Elect at the FPA Convention on July 16, 2017. Read more. Wanda I. Santos Marrero, Pharm.D. ('07), IPPE preceptor at HIMA San Pablo, Bayamón, Puerto Rico, is recognized as an Invaluable Preceptor by the Puerto Rico campus. Malisandra Menendez, Pharm.D. ('08), joined Seminole State College of Florida as an adjunct professor and is also a Pharmacy Manager at Walgreens. David Pino, Pharm.D. ('10), was honored by Florida Pharmacy Association (FPA) for his three years of service as FPA Director of the House of Delegates. 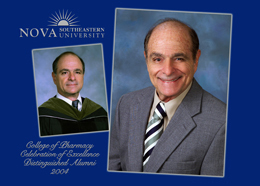 Dr. Pino is the Pharmacy Manager at the NSU COP Clinic Pharmacy. Kailin Li, Pharm.D. ('11), is now an advisor at CVS Health in Woonsocket, Rhode Island, and has been with CVS Health since 2007. Livia Macedo McCuitcheon, Pharm.D. ('11), appointed assistant professor of pharmacy practice, Wilkes University, Pennsylvania. Mitchell Nazario, Pharm.D. ('14), appointed Chief, Outpatient Pharmacy, US Army Healthcare in Fort Hood, Texas. Deylen S. Aponte, Pharm.D. ('15), appointed Clinical Pharmacy Specialist at Central Texas Veterans Healthcare System, a multi-specialty outpatient clinic. Valerie Guerrier, Pharm.D. ('15), started at Wellington Regional Medical Center, Wellington, FL, as a Clinical Pharmacist. Melissa Santibañez, Pharm.D. ('15), appointed assistant professor, critical care, Larkin University College of Pharmacy, Miami, FL. Alexa (Ali) Vyain, Pharm.D. ('15)., appointed clinical assistant professor at University of Houston College of Pharmacy, Houston, TX. Mercedes Dorado Rodriguez, Pharm.D. ('17) started at Farmacia Cristina in Puerto Rico. Akesha Edwards, Ph.D. ('17), appointed assistant professor pharmacy practice at University of Findlay, Ohio. NSU COP will celebrate 30 years of excellence (1987-2017) this November 4, 2017. Please join us on Saturday, November 4, 2017, at 7 pm at the Crowne Plaza hotel at 4000 S Ocean Dr., Hollywood, FL 33019. For more information and to register visit our 30 Years of Excellence invitation or contact copalumni@nova.edu. Have you updated your email? Effective September 1 the email for life alumni benefit ended. Alumni using NSU emails will need to forward these emails to their personal email accounts. New alumni will have 90 days after degree conferral until the nsu email accoun is deactivated. For more information on the discontinuing of the @nova.edu alumni email benefit visit alumni email benefit. Students and faculty spent 18 days studying and practicing alongside medical professionals providing health care to the underserved community in Santo Tomé. Clinical activities were coordinated by the Department of Primary Health Care and Clinical Therapeutics of the Instituto Universitario de Ciencias de la Salud (IUCS). Activities included patient care discussions, clinic rotations, workshops and classes, immersing students into the epidemiological profile of the region, and treatment and medication therapies for different pathologies. In addition to visiting cultural sites in Buenos Aires, the group visited the Esteros del Iberá National Park and world famous Igazú Falls. Continuing our collaboration with Comenius University in Bratislava, faculty and students spent 18 days studying pharmaceutical technology, pharmacognosy and botany, as well as learning about the health care system in Slovakia and the European Union. Visits to local pharmacies and hospitals, the state institute for drug control and a local pharmaceutical plant enhanced the didactic curriculum. After cultural tours of the host city, a day trip to Vienna, Austria, a tour of a pharmaceutical complex in Milan, Italy, the travel study ended in Florence, Italy. Third year student Yana Vorontsova stated this experience was beyond anything she could have imagined and would recommend NSU travel study programs to students seeking to expand their knowledge of global pharmacy. 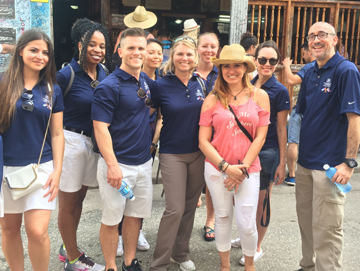 NSU COP is one of the first NSU colleges to visit Havana, Cuba. A team of faculty, alumni, and students, including Dean Lisa Deziel, Pharm.D., Ph.D., and Matthew Seamon, Pharm.D., J.D., associate professor and chairperson of the pharmacy practice department presented a proposed partnership at the IV Encuentro de Ciencias Farmaceuticas y Alimentarias, visited an anti-doping lab, and distributed donated supplies to Siervas de Maria, Ministras de los enfermos from Broward Meat and Fish Company, Dr. Mark Damerau, DMD, Pill Box Davie, Skyemed Pharmacy, Debra Edwards Juicery Rx, and Liberty Pharmacy. In addition, the college is exploring opportunities to collaborate with Cuba’s Ministry of Public Health and the University of Havana. This collaboration will be multi-faceted and include a Travel Study Program, opportunities for Pharm.D. students to complete Advanced Pharmacy Practice Experiences (APPEs) in Cuba, and faculty exchanges among other emerging ideas. To view some of the exciting activities visit NSU COP in Cuba YouTube video. 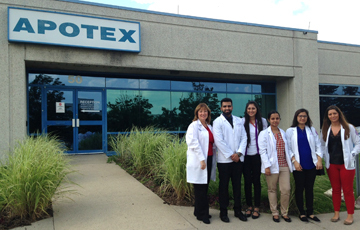 This summer Apotex, Inc., a Canadian pharmaceutical company with presence in Broward County, provided scholarships for NSU COP students and a faculty member to travel to its corporate headquarters and main facilities in Toronto, Canada. The three-day visit included tours of research and development, production, and distribution. Several meetings were held with senior executives as well as co-op students from universities across Canada completing their required work experience at Apotex, Inc., and a visit to the University of Waterloo School of Pharmacy. Ashini Shah, (’18) stated this was the best time and thanked Apotex, Inc. and NSU COP for providing this amazing experience. Pictured on the left - Elizabeth Shepherd, Pharm.D., assistant dean, strategic partnerships and program development with students in Toronto, Canada. Two Pharm.D. students participated in an inter professional trip to the Dominican Republic in July. 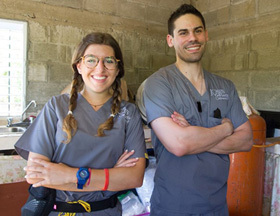 Class of 2019 students Victor Alvarez-Guerra and Lyan Porrato from the Puerto Rico Regional Campus assisted in providing pharmaceutical care to underserved and underrepresented persons at clinics throughout the area. In addition to provide much needed service, the students took donations of non-prescription drugs, toys, and clothing for distribution. NSU College of Pharmacy hosted two guests from Comenius University in Bratislava, in August. Sponsored by the Erasmus Programme, a European exchange program encouraging cooperation and the growth of international studying, Kristína Piatničková from the Faculty of Pharmacy, and Veronika Haberlandová from the Office of International Relations met with students, faculty, and administrators in the college and from across the university to share ideas and discuss new opportunities for collaboration. The visitors were impressed with the large number of resources offered to students and the new prospects fostered by this growing relationship between Nova Southeastern University and Comenius University in Bratislava. NSU is one of a handful of US universities that have the opportunity to participate in the Programme. Shown in the picture are members of the College of Pharmacy with the visitors (L-R: Brian Stonebraker, Elizabeth Shepherd, Ana Castejon, Kristína Piatničková, Veronika Haberlandová, Dawn DaCosta, and Robert McGory). Read the story in Sharkbytes. September 15 – Feria de Salud (Health Fair), San Juan, PR – For information contact NSU College of Pharmacy, Puerto Rico, or call (787) 773-6583. September 16-17 - Continuing Education: Initial Consultant Pharmacist License and alumni lunch/social, Fort Lauderdale, FL. For information and to register. September 19 – United Stance Symposium, The Joint Effort in Solving the Opioid Epidemic, NSU University School Center for the Arts, Fort Lauderdale, FL. For information and to register. October 5 – Distinguished Alumni Forum - Dr. Richard Weisler. For information contact Aiman Rahman. 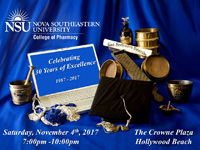 November 4 - College of Pharmacy Alumni Homecoming/30th Anniversary Celebration, Crowne Plaza-Hollywood Beach, FL. For information and to register. November 4-5 - Continuing Education: NSU Fall Classic 2017 and alumni lunch/social, Fort Lauderdale, FL. For information and to register.